Home » The Right kit » Underated kit- The head band! Underated kit- The head band! One of the great things about getting old......er, I mean older, is that you're not so worried about how you look, and this opens up a world of possibilities when it comes to kit! Outlandish colours, ill fitting lycra, tight base layers over a pot belly....it's all good! Into this category I would probably put the "Headband". A staple of 1980's basketball players, tennis aficionados and fell runners the headband is probably up there when it comes to "I'm not going out in one of them!" pieces of kit. And so it was I found myself gearing up for a run on a damp and cold day yesterday. I'd walked my daughter up the road to a party and was surprised at how cold it felt. I went home, but on my Brynje Super thermo mesh shirt, and another mesh C-shirt over it (all the warmth, but very breathable) with a Brynje prototype windproof over the top. 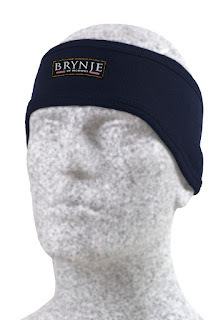 I put thin gloves on and for the first time pulled the Brynje headband on. I figured it wasn't cold enough for a hat or buff........it has to get pretty cold to wear a hat running. I set out on a very muddy trail with the threat of rain and the damp cold air clinging to me. I was nice and warm and had the ability to zip down the jacket as I really started to warm up on the first hill. The ability to vent is always a "must".....can't stress that enough. It seemed to get warmer as the run went on, and so I ditched the gloves and headband and unzipped the jacket all the way. This lasted for about 10minutes when I rounded the corner to run alongside the A22. Suddenly the temperature seemed to drop again so up came the zip and on went the headband. It was an instant feeling of warmth as the breeze no longer cut into my sweaty cold head. At this point I looked around for my dog and realised he was gone. Now this is not abnormal for him when we are running in the forest, but generally he'll come back after a few minutes of whistling. I carried on my route but as I got further on, I realsied I'd have to go back for him. Out went the timed run, the heart rate monitoring of the route as I had to retrace my steps. About half a mile back down the track, I spied him down in the valley. I called and he came back.....very dirty and looking a little happy with himself. We ran home via an "alternate" route, making sure he stayed by my side! When i got back, I didn't even realise I had the headband on until I bumped into my neighbour who asked "Is that a Brynje headband??" A moment of self consciousness passed very quickly as I realsied it had worked well and done it's job of keeping my head/ears at a comfortable temperature. I take my hat off (I mean headband!) to the Norwegians.......great piece of kit......if your older and don't care of course! !